Tim Sutton’s debut feature Pavilion (2012) begins like a conventional narrative, but then confounds viewer expectations. Those waiting for a story to coalesce will no doubt be puzzled when the film veers off in surprising directions. The focus on characters, for example, shifts abruptly after twelve minutes. Pavilion, it turns out, is far less interested in plot or even character development than in combining images, sounds, and music into a more purely cinematic experience that explores the insular world of teenagers. Sutton has said in interviews that he was interested in capturing the mystery of adolescence. Part of that mystery, however, is its opacity – its refusal to disclose fully. Yet the strength of Pavilion resides in how the film manages to render the lives of teenagers so vividly. Pavilion begins with a group of teens shooting off fireworks. We watch them play with Nerf guns, ride their bikes through the neighborhood, get high, skateboard around fountains, and drive home at night. The film, which has the equivalent of a prologue and coda, actually has a sliver of a plot that holds it together. It centers on a fifteen-year-old named Max (Max Schaffner), who lives with his mom and hangs out with friends in upstate New York over the summer. He climbs trees, hikes in the forest with a female friend named Addie (Addie Bartlett), and the two take a dip in the lake. Through a phone conversation, we learn that Max is going to live with his dad in Arizona. Pavilion is less about causal connections between scenes than it is about striking visual images and strong contrasts once the film shifts locations. Max’s more idyllic life with his mother in rural New York contrasts starkly with the arid landscape of Arizona, where Max suddenly finds himself stranded in a motel room with his unemployed dad. Lush nature gives way to barren, flat stretches of desert and cement; stability gives way to transience; the freedom of the outdoors transforms into claustrophobia, an expansive lake shrinks to a small swimming pool, and a carefree mood turns more melancholy. After observing the local kids riding bikes below his motel window, Max eventually hangs out with them. He strikes up a friendship with a kid named Cody (Cody Hamric), who, along with his pals, has a penchant for performing mountain bike stunts. While the film focuses mainly on Max, he eventually recedes into the background, to be replaced by Cody. The teenagers in Pavilion inhabit a world which, for the most part, remains inaccessible to most adults. Early on, a kid’s mother, who calls her son “dude,” tries to get a kiss from him as he heads out the door, but he ignores her request. She laments, “I gotta try!” Max’s mother laughs giddily as Max and Addie dive into the lake for a swim. She later offers a positive assessment of Addie, but barely receives a response from her son. Conversations between teens and parents or between the kids themselves consist of words that don’t so much communicate as fill up awkward pauses. As a result, there’s very little “dialogue” in the film, and what’s said is not terribly significant. The kids are largely unable to articulate their feelings. Max’s conversations with his father, for instance, are short and perfunctory. When Max and Addie trek in the forest, they obliquely discuss the fact that he’ll be moving to Arizona, but this appears to have little emotional impact. It is almost as if the events controlling the kids’ lives are occurring in an alternate universe. Will Max and Addie miss each other? We haven’t a clue. Do they have real affection for each other? It’s not clear. At one point, as they get far into the woods, the two of them stop. We might expect them to kiss, but Addie merely takes Max’s hat off his head and puts it on her own. For Pavilion, Sutton chose a number of teenagers and two major locations: an area in upstate New York, where he grew up, and Chandler, Arizona, just south of Phoenix. Sutton wrote a short story instead of a script, but he did so mostly to communicate with his cinematographer. He then created an outline of scenes that would change and develop in the course of shooting them, so that the film grew organically out of the process of making it. As a result, Pavilion is composed of stunning imagery, physical actions, bodily and facial gestures, snippets of conversation, intricate sound design, and a haunting musical score by Sam Prekop. 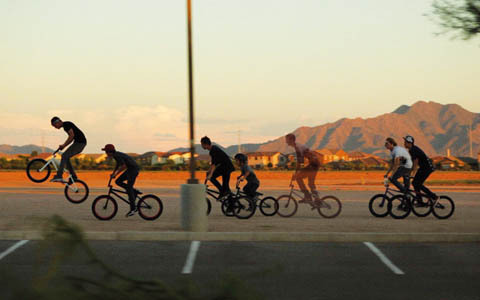 Beautifully shot by Chris Dapkins and seamlessly edited by Seth Bomse, Pavilion has even less narrative than most other indie films it resembles – from films by Gus Van Sant to Matthew Porterfield’s Putty Hill (2010) and Clay Jeter’s Jess + Moss (2011). Pavilion played at SXSW and BAMcinemaFest. It was picked up for distribution last summer by Factory 25, which has been busily scooping up some of the most challenging recent indie films. Pavilion is scheduled to open at the IFC Center in NYC on March 1.